The Grassroot team, which involved its head Grant Connell, Trevor Sam, Onike Spann and Kyle De Freitas visited Canouan, Mayreau and Union Island. In total, 142 youngsters were in attendance on the islands visited. First to taste the expertise of the team were the students of the Canouan Primary School. Connell and Spann went onto Mayreau, where Tennis was introduced to several youngsters on the island. Connell told SEARCHLIGHT that the Mayreau experience was rewarding since it was the first in the recollection of many on the island that Tennis lessons were provided to the youngsters. Connell said that the unmarked court is located on a hill and improvisation through the use of mini nets was necessary. He was high in praise for John Roache, FCIB Unsung hero, for his input in co-ordinating the Mayreau sojourn. GTC handed over a quantity of equipment to be used on the island. 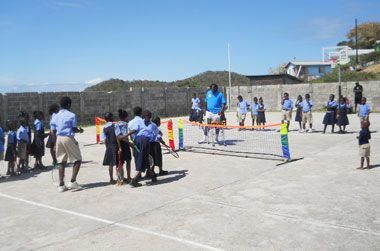 Connell disclosed that Grassroot Tennis Club would undertake to mark the courts and provide nets for both Mayreau and Union Island. Connell disclosed that GTC can also provide coaches for the Southern Grenadines. Connell is also hopeful that the National Sports Council and the National Lotteries Authority would see this project as worthy, and support the growth of tennis in the Grenadines. âIt would be good if various sporting disciplines can start programmes of a similar nature and keep the youths active,â Connell advised.